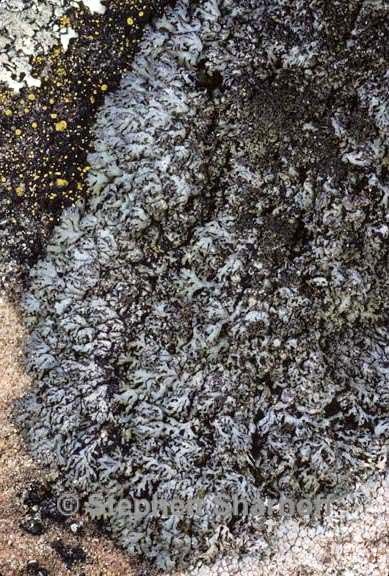 Thallus: foliose, up to 5 cm in diam., irregular to more often orbicular lobes: linear and discrete, or occasionally somewhat irregularly rounded and partly imbricate, 0.2-0.6(-1) mm broad, usually +flat to irregularly convex, prostrate upper surface: gray-brown or brown, epruinose (or rarely with very sparse pruina on some lobe ends), sometimes with a patchy or +continuous, whitish epinecral layer formed centrally, isidiate isidia: granular to somewhat cylindrical, usually brown (darker than the rest of the upper surface cortex) and pseudocorticate, sometimes appearing essentially like isidioid soredia, primarily in irregular, short to elongate marginal clusters, sometimes also becoming laminal in older parts upper cortex: paraplectenchymatous medulla: white lower cortex: paraplectenchymatous lower surface: black, sometimes paler at the lobe ends, dull or rather shiny; rhizines: simple, black Apothecia: occasional, up to 2 mm in diam., sessile; margin: entire or becoming lobulate ascospores: ellipsoid, 16-22 x 7-11 µm, Physcia-type Spot tests: all negative in cortex and medulla Secondary metabolites: usually none, trace terpenoids sometimes detected. Substrate and ecology: rock, rare on bark or wood World distribution: North America, Europe, New Zealand. Sonoran distribution: widespread in the Arizonan mountains, Baja California, and Chihuahua. Notes: The narrow lobes, dark color, primarily marginal/ submarginal isidia, and saxicolous habitat of Phaeophyscia sciastra well distinguish this taxon from most other members of the genus (but see discussion of e.g. P. adiastola). Poorly developed specimens with sparse or (rarely) missing isidia, are easily and often confused with P. decolor. Very careful examination is sometimes required to detect the isidia, and the latter species can also be distinguihsed by its producction of zeorin. Occasional specimens of P. sciastra have numerous laminal isidia, which if they are finer than usual or become abraded, can be mistaken for soredia, resulting in identification as P. orbicularis or one of the similar sorediate species.